Catalign Innovation Consulting: Confirmation bias: an innovator’s curse? Confirmation bias: an innovator’s curse? 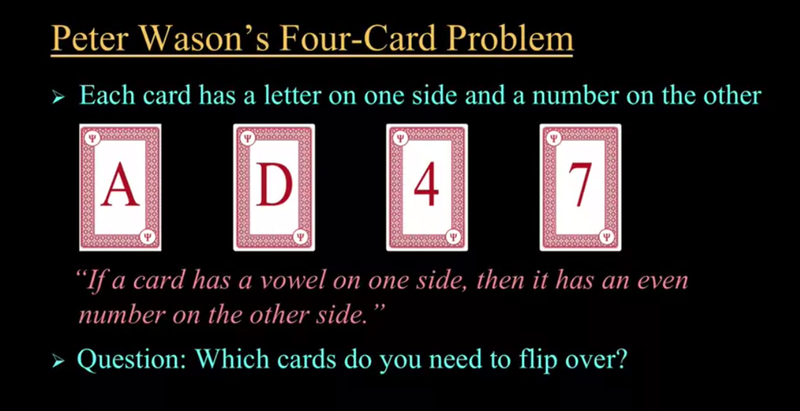 Take a look at the four card problem depicted in the picture above. Each card has a letter on one side and a number on the other. 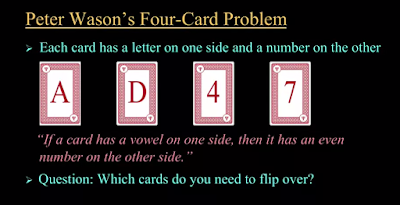 Now, the hypothesis is as follows: “If a card has a vowel on one side, then it has an even number on the other side.” The question is: Which cards do you need to flip over to validate the hypothesis? Before you go ahead, please take a minute to answer this question yourself. I have asked this question to many participants in my workshops. And most of them have a clear answer i.e. the cards with letter A and number 4. Right? Wrong. The real answer is cards with letter A and number 7. Why? Because, if you find a vowel when you flip “7” card, then you disprove the hypothesis. But why do most of us think of flipping over the “A” card and not "7" card? Because all we are trying to do is to find data that agrees with the hypothesis. This tendency to find and interpret data such that it conforms to our beliefs is known as confirmation bias – sometimes referred to as “the mother of all biases”. Due to this bias, we also ignore data that proves our belief wrong. I feel that confirmation bias is an innovator’s curse because it prevents him from seeing evidence that is contradictory to his idea and creates an illusion of “my idea works!” in spite of contrary evidence. How does the confirmation bias manifest in real life? What can we do to mitigate its effect? Let’s explore in this article. Gyanesh Pandey is a co-founder of Husk Power Systems based Patna, Bihar. HPS is in the business of providing electricity to rural India, especially off-grid villages. When Gyanesh first thought of pursuing the challenge of electrification of rural India, he had an implicit assumption (see the story in detail here). Rural India is not electrified because the right technology is not available yet. For the next four years, Gyanesh experimented with cutting edge technologies in the field – polymer solar cells, wind energy, bio-diesel etc. None of these experiments yielded viable solutions. By chance, he met a supplier of gasification based electrification systems and he got the seed idea of HPS from that. The core technology of the gasification based electrification is more than half a century old. And that contradicted the core assumption Gyanesh started with. i.e. You need a cutting edge technology to solve this problem. Gyanesh recalls making such an assumption “a big mistake”. That is how confirmation bias operates in real life. Once you believe that cutting edge technology is needed to solve a problem, you will only “see” data that corroborate your belief. A few months back I was facilitating a workshop at a start-up accelerator. All the participants had quit their jobs and started companies. At the beginning of the workshop, I asked if participants had any expectations. One of the participants asked, “I am looking for a tool that can help me predict the revenue of my company”. I realized that the entrepreneur had implicitly assumed that it is possible to predict revenue of his start-up. I tried to tell him that it is not possible to predict the revenue especially when you don’t even have a single customer. My guess is, if the confirmation bias is really active, he would ignore my comment and look somewhere else for the tool he is looking for. Is there anything we can do to mitigate the effect of confirmation bias? Well, here is something I find useful. Every time I become aware of my belief, I ask, “Do I have data for this?” I call this belief-as-an-assumption perspective. Shifting perspective from belief-as-the-truth to belief-as-an-assumption is the first step. It creates an opening for truth to enter. The next step is take contradictory data seriously. I feel that the first step is the key. It needs an alertness to observe your own repetitive thought patterns. As a co-author of “8 steps to innovation” book, I am likely to carry a bias to find and interpret data such that “8 steps” framework works. Hence, I consciously try to reflect on data that may show that it doesn’t work or at least part of it doesn’t work. Blogs such as ‘Is “8 steps to innovation” approach predictive or non-predictive’? are result of such reflection. Can you catch yourself arguing with belief-as-the-truth perspective? Image source: Social Psychology class from coursera.org taught by Prof. Scott Plous of Wesleyan University.